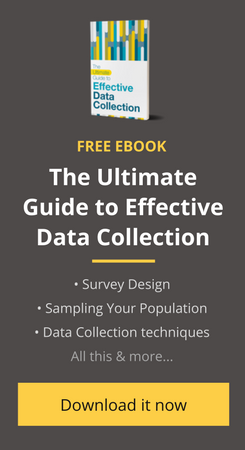 We’re excited to announce that we published a free ebook about data collection! Data has become fundamental in nearly every aspect of life, and all types of companies — from large technology companies to small rural non-profits — are collecting data on their work. Surveys are an indispensable tool for data collection, but they are not simple to create. A poorly-designed survey will lead to useless data, wasting your time and money. That’s why we’ve created our ebook, “The Ultimate Guide to Effective Data Collection”. This ebook is designed to help anyone design, write and conduct a survey. It includes an introduction on the importance of high quality data, plus 9 chapters about how to design your survey and collect data more effectively and in less time. Read testimonials for the ebook and download it here! Are You Following These 6 Steps to Avoid Response Bias In Your Survey?